Original image, point spread function that simulates motion blur, convolved image (blurred image), spectral components of the image, deconvolved image, and residuals. Convolution appears in nearly every measurement problem. A well know example is the Hubble space telescope. In the early days, deconvolution techniques had to be used to correct for a flaw in the telescope's mirror. 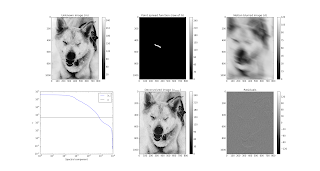 Here's a demonstration of deconvolution I wrote.. The point is to demonstrate that a discrete Fourier transform (FFT) can be used to diagonalize a Toeplitz-matrix (convolution operator). This allows us to perform linear least-squares on million by million sized full theory matrices in less than a second. This wouldn't be possible otherwise. It is also possible to regularize the problem by applying regularization to each spectral component of the spectrum of the point-spread function, as the all of the matrices (theory matrix, error covariance matrix, and prior covariance matrix) in the full maximum a posteriori estimator can typically be diagonalized as they are also typically Toeplitz matrices. I've attached the deconvolution code below. This is essentially what I use to deconvolve range-Doppler ambiguity functions from incoherent scatter radar measurements at Arecibo. Only a few lines of code are used to do most of the work. # sort 2d fourier components by magnitude and convert into 1d vector for plotting.